The Latin American Film Festival will be held in Seoul from Tuesday to Sunday for its fourth straight year, showcasing films that unveil the desires and concerns of contemporary Central and South Americans. The embassies of Argentina, Brazil, Chile, Colombia, Costa Rica, Ecuador, Mexico, Panama, Paraguay, Peru, the Dominican Republic and Uruguay will each present a movie that highlights its own culture, society and history, including international award winners. The event is organized at Cinematheque KOFA in Seoul and in collaboration with the Korean Film Archive. The 12 featured films cover a diverse range of genres, including documentary, drama, comedy, musical, fantasy and thriller. They are “The Last Suit” from Argentina, “Till Luck Do Us Part” from Brazil, “Gloria” from Chile, “When the Guns Go Silent” from Colombia, “The First Lady of the Revolution” from Costa Rica, “Manana No Te Olvides (Tomorrow Do Not Forget)” from the Dominican Republic, “Alba” from Ecuador, “Tigers Are Not Afraid” from Mexico, “Cinco Historias del Canal y un Siglo de Vida (Five Stories of the Canal and a Century of Life)” from Panama, “The Heiresses” from Paraguay, “I’m Still” from Peru and “Local God” from Uruguay. 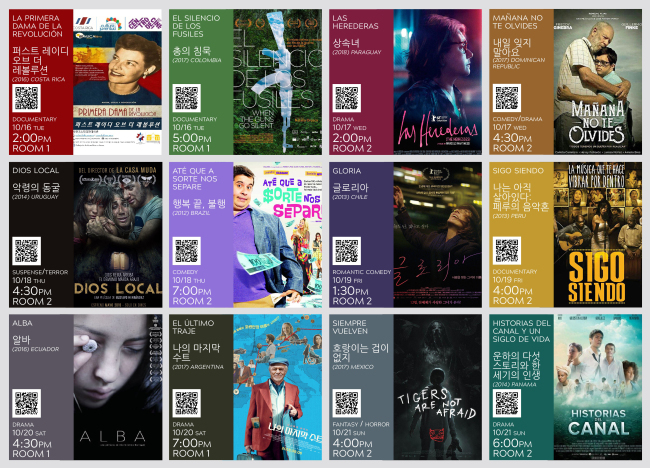 For screening information, visit the website at eng.koreafilm.or.kr/cinematheque/programs/PI_01153.